What is the ChiForLiving / Chi for Caring system of movement? Chi for Living is a balance and mobility program teaching fitness movement for daily activities geared towards those who want to remain active as they age. Chi for Caring is basically the same program with modifications made for an older senior audience and incorporates more seated / chair based movements. A balance and general mobility program focused on building leg strength and range of motion. Based in Tai Chi / Qigong principals, it teaches skills used in advanced classes. The exercises incorporate a mix of stretching, balance work, and Tai Chi style movement. The gentle weight bearing exercise utilizes controlled breathing, patterns and coordination which trains movement of the whole body as an integrated unit. Contact Stan to discuss bringing his program in for a demonstration and evaluation to see how your residents can benefit from these gentle yet effective mobility programs. This program is geared for those 55 and above who have moderate mobility issues. Standing for some of the exercises is required to work on balance and leg strength. Participants learn exercises to increase and enhance balance, range of motion, leg and core toning and breathing. The standing movements are low impact yet weight bearing. Combined with gentle weight shifting, participants build supporting muscle strength and balance. Classes consist of learning movements, education on the purpose of the exercises and related applications. 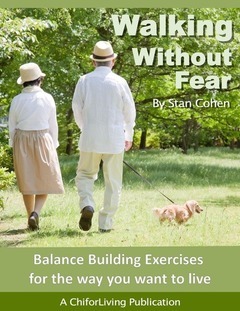 As an alternative to traditional exercise programs, Stan’s program has proved itself to be effective. I am a resident here at Paragon. I must say, I look forward to Stan coming in every Thursday. He makes me feel so much better. Thank you so much Paragon Village for making it possible for Stan to be here. I am also a resident of Paragon Village. I’m delighted that Mr. Cohen comes here every week and teaches us. His method is a very easy and enjoyable way of teaching. I hope he continues to come here permanently.